I like a good “What If” tale, and as far as those things go, this one — based on a 1963 novel by Austrian writer Marlen Haushofer — is a doozy. 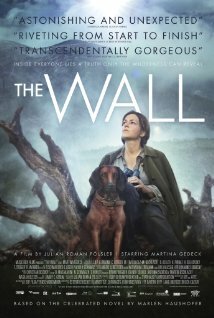 The titular wall appears pretty early in the film and from that moment on, actor Martina Gedeck is on her own aside from a cat named Lynx and a friendly cow. Her performance is a true tour de force, anchoring this fantastical tale firmly in reality. Her character’s isolation, despair, happiness, and wonder at nature all became palpable things in her talented hands and it’s no wonder she won Best Actress at the Austrian Film Awards, amongst other ceremonies. No less than six cinematographers are credited on IMDB, which is surprising, but they did an amazing job. From the shining, untrampled crust of an Austrian snowfall to the glowing alpine sunsets of summer, this movie is absolutely gorgeous. Depressing at times, but gorgeous. The film has a running voiceover by the character rather than dialogue and it worked well for me. Gedeck delivers her thoughts in a rather matter-of-fact way as she writes down a chronicle of her time within Die Wand (The Wall), bringing surprising beauty out of the German language. Like the change of seasons, the film goes from calm contemplation to despair and back again. It’s harrowing at times, and I’m not sure I’ll find myself going back to it often, but the beauty and thought-provoking aspects of the film impressed the hell out of me. Every so often I need cinema like this to cleanse my palate after the 15th movie where Hollywood superheroes knock down a city block.